With the Fourth of July Holiday just around the corner, I found my thoughts wandering toward the sunny California coast. So, I thought I'd share one of my favorite historical tile haunts, The Adamson House. It's located right on the Pacific Ocean and steps from the Malibu Pier in Malibu, California. Even if you aren't interested in tile and California history, it's hard to find a reason not to visit this lovely location. Located right on the coast in stunning Malibu, the grounds of the Adamson house make for an enjoyable summer destination. The grounds alone are simply stunning and open to the public every day during daylight. The Adamson house is a Spanish Colonial Revival home that was built in 1929. It has a unique mix of Spanish and Moorish architecture styles and perhaps one of the most comprehensive collections of tiles from the day. Famed Malibu Tile was manufactured just steps from there. As the trophy home of the factory owners, the home is nothing short of a showpiece. The factory produced tiles that are still coveted today and can be be found in some of Los Angeles' architectural treasures, such as the Mayan Theater and City Hall. Glazed terracotta planters with ornate designs are clues to what await. Today, we'll explore only the outside grounds. But, stay tuned for next week's post where we'll show more details and provide a bit of history on this tile treasure trove. Tiled outdoor tubs were used for washing pets - in style! Did you enjoy today's post? Then you might want to subscribe to Avente Tile's mailing list for free! 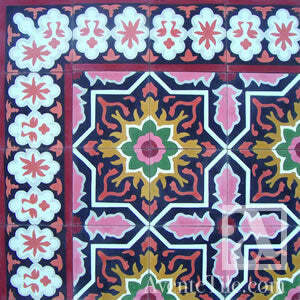 Subscribers receive our hand-painted ceramic and cement tile newsletter, Tile Talk, once per month. Tile Talk offers great hand-painted ceramic and cement tile design ideas, tile tips, and information about new ceramic and cement tile products. We also explore historically significant tile installations, such as today's post, as well as photos of hand-painted ceramic and cement tile installations and designs, and perspectives from designers and architects who have specified and installed beautiful hand-painted ceramic and cement tiles. We think you'll find lots of inspiration! Next week's newsletter will provide a historical perspective on Malibu tile and more information about this endearing historical landmark. Sign-up now for your free copy of Tile Talk! With the Summer Solstice now behind us, it's time to celebrate this much-anticipated season by enjoying the outdoors. I enjoy taking my daily neighborhood walks early in the day. It's during these walks that I stop to admire the tiled walks and entries. In this post, I'll be sharing some of my favorites that not only add to a home's uniqueness, but those that also provide welcoming curb appeal. It's easy to see why a tiled cement sidewalk offers so much more style than a typical grey, poured sidewalk. Colorful tiled walks provide a bright, eye-catching entry to a home. Red is a great choice for Mediterranean, Spanish, Spanish Colonial, Spanish Revival, and Adobe style homes. If you have a large landing or patio, then consider adding a medallion or patterned stair riser tiles. 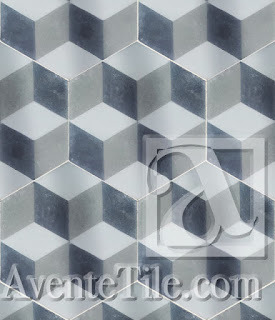 Further, the exquisite beauty of hand-poured cement tile in plain colors is unmatched. You can see the hand of the tile artisan in the installation with the variation in color and shade from tile to tile. The floor or sidewalk almost shimmers like a gem, especially in full light. Look at the Heritage Indian Red walk below and you'll see what I mean. The tiled stair risers catch your attention, while the plain red walk causes you to linger and pause. Use our Rustic Pavers, laid on a wide grout line to accommodate their irregular shape, to create Old World elegance. If you want to replicated an antique look use Cotto Dark; Cotto Gold looks like traditional Spanish bisque. Or use a blend of the two, Spanish Cotto, to create lots of charm and interest with the color variation. Additionally, our Rustic Pavers color palette includes the tones found in Mexican pavers or Saltillo tile. So, you can even replicate the look of Saltillo, too. This long entry path is made interesting by using Arabesque Octagon Rustic pavers in Cotto Dark. DESIGN TIP: When using shapes that are not rectangular or square, like hexagons and octagons, make sure to frame the edge of each side of the path with a rectangular tile. Rustic pavers, shown here in Buff, look like Saltillo tile but will wear better. DESIGN TIP: Create the look of Saltillo tile or Mexican pavers with cement tile. It's more durable, requires less care and is available in more sizes, shapes and trim. Malibu deco tiles on the stair risers with Rustic Pavers in Mission Red for the treads. DESIGN TIP: When laying tile on paths that are not square or do not run perpendicular, consider laying them "on point" to avoid mismatched grout lines, or you can use different sizes of tile. Whether you're recreating the rustic elegance of Old World Spanish bisque or Saltillo tiles, looking for unique formats, or the exquisite beauty of hand-poured plain cement tile, we have a tile that works with your design aesthetic, color palette, and space. Are you looking for Spanish Colonial, Spanish Revival, Moorish-inspired designs, or something slightly more contemporary? No worries. We can help you create a look for a tile walk that is extraordinary, unique and in keeping with a home's architectural style. Sealers for cement tile should be applied to protect the tile from water and staining; but, they can also be used to enhance or restore color. A color-enhancing sealer was used on this exterior cement tile walk, stair risers, and treads to protect them and brighten the colors. especially exterior tiles subject to fading from the sun. 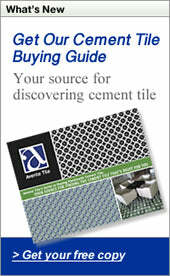 Sealers remain one of the most misunderstood and confusing steps of installing cement tile. The confusion comes from the different types of sealers (impregnating, topical, color enhancing), the nomenclature used (impregnating is the same as penetrating), and the dizzying number of manufacturers and specialized products offered. Step #1. Select a high-quality penetrating or impregnating sealer. You may use either a water-based or solvent-based sealer. Water-based sealers are slightly easier to apply and may provide better coverage protection because they aren't as deeply absorbed into the tile. Solvent-based sealers have a strong odor when applied and may provide longer protection, especially against water. I explain this thoroughly in a previous post, Sealing Cement Tile. Step #2. Select a topical sealer if you want to provide additional finish effects to the tile. Penetrating sealers usually do not effect the finish of the tile because they work by impregnating the tile below the surface. Topical sealers create a barrier on the surface of the tile so that stains do not reach the cement. Topical sealers have different finishes that include shiny, satin and matte. Often, matte topical sealers are produced by adding a chemical that cuts the shine, but also weakens the sealer. Topical sealers are not generally recommended for exterior applications as radiant energy from the sun deteriorates them quickly. Topical sealers will wear over time and generally need to be reapplied more frequently that penetrating sealers. Color-enhancing penetrating sealers can be used to enhance (brighten or darken) the colors of the cement tile. This is a good choice for exterior applications that are subject to fading from the sun. Step #3. Test your sealer/sealer combination. Always test the final choice of your sealer or sealer combination. Simply apply to a test tile and make sure the desired finish is achieved without any adverse reactions. Step #4. Clean the area to be sealed. Make sure the tiles to be sealed have been cleaned, all grout has been removed and the tiles are thoroughly dry. Start with a physical cleaning with a blower or broom. Then clean with a tile cleaner or mild detergent and rinse with water and a grout sponge. If the tile looks hazy or cloudy, clean again. Step #5. Apply the sealer. Use a lamb's wool applicator, lint-free rag or paint brush. Generally, you'll want to apply three coats allowing the sealer to dry between each application. Make sure to apply generously; but, do not allow the sealer to pool, streak, or run. Tile immediately after applying a color-enhancing sealer. As you can see, there are no pools of sealer or streaks in the sheen. Cement tile often exhibit "crazing" or fine, hairline cracks over time. This is not a defect and does represent any problem with the tile; however, it will be more apparent when the tiles are wet or when applying a sealer. The small cracks or branches show more on dark tiles and plain tiles. Don't panic or think you've done something wrong if you see this after applying a sealer or if the tiles get wet. Cement tile crazing can be seen in the plain red stair tread. Small fissures, or crazing, are more apparent on dark colors and when the tile is wet. This short video shows how to apply a penetrating sealer to unsealed and previously sealed cement tiles. This important part of the installation process protects cement tile from water and staining. I show how easy it is to apply a color-enhancing impregnating or penetrating sealer to a tile walk and patio. I also recommend products to use and where to get them. You can see for yourself, just how easy it is to apply a sealer. These five simple steps will ensure success for every cement tile project you do. If you aren't sure about which sealer to choose or if you should apply a grout release. We can help! These handy guides will give you all the information you need to know! Nothing excites me more than seeing a customer's installation photos. Readers of this blog know that I love color and pattern. Needless to say, I was thrilled when a customer from La Crescenta, CA called to order more tile. She was also gracious enough to send me installation photos from her previous order. As you can see, the showy bathroom uses one of our boldest, most colorful cement tile patterns, Melilla. Not only did the customer embrace color and pattern, they also combined cement tile with mosaic wall tiles. With the addition of exquisite fixture details, this master bathroom is nothing short of jaw-dropping. What's more, this is a truly unique look that speaks to the homeowner's attention to detail and passion for design. Rich cement tile patterns in warm tones play off the cool blue patina of the vanity. View of the vanity and cement tile floor from the walk-in shower. patterned cement tile can coordinate with other tile styles. The use of traditional cement tile rugs, with full pattern flooring and more contemporary mosaic wall tile, show how cement tile can adapt and work with just about any style or theme. Another way to mix-up a design is to use warm colors in a bathroom. Conversely, blues, aqua, turquoise and cobalt are also a sensory-pleasing choice for a bathroom because of the water metaphor. I really love seeing a pool's sideboard tile in a fire red, and the warm color choices used in this bathroom. You feel the energy and can't help but feel awake and alive! 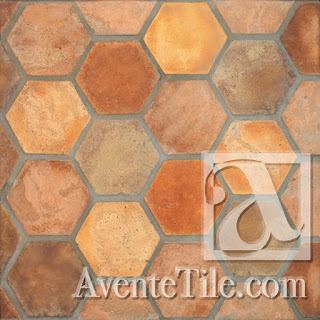 Cement tile rug surrounded in terracotta-colored plain cement tile. Pattern floor tiles are run to the edge of the room in the master bath. However, a traditional cement tile rug is used in the shower. Both are paired with terracotta-colored cement tile and small-format mosaic wall tile. Mixing up design style and techniques really work because the color palette flows together flawlessly. No easy task considering different vendors provided the other tiles and furnishings. Running the pattern to the edge works well. Also notice the appropriate use of negative space and white walls. Good design has to allow for this especially when using a rich, color pattern. The Traditional Melilla pattern in our standard catalog colorway has a dizzying array of colors that makes it difficult to work with; however, that is also what makes it so bold and exciting when used with the right color choices. View additional colors available within the Heritage Cement Tile Palette here. Kudos to our customer for creating such a warm, rich and tantalizing bathroom with Avente's cement tile. Who wouldn't want to be in this bathroom? I just love everything about it! Cement tile rug, pattern tile and plain cement tile work exquisitely together. Feeling inspired? Want to see more cement tile design ideas, installations, and inspiration? Let us help with our design ideas. Star and Hexagonal Tile Panel, 13th-14th century (Nishapur, Iran). Image via The Metropolitan Museum of Art. Steeped in a rich history of architectural, design and natural elements, the hexagon is a fundamental shape when it comes to building. The six-sided polygon, which can be found in honeycombs, crystals, snowflakes, and most importantly tile, creates a classic yet distinguished look. Beginning in late 2013, it was evident the hexagon was once again climbing in ranks as a desirable shape in the designs and patterns of tile. During Coverings 2015, hexagons played a more sophisticated role in terms of visual and tactile significance with increased offerings in cement, encaustic, glass, porcelain, ceramic and stone. Also of importance was how the hexagonal shape was used in everything from small mosaic tiles to large format tiles, as both a flooring and wall tile. Patterns, textures and embossing further elevated the hexagon’s allure among the attendees of Coverings. In a further testament to its time-tested flexibility within the design and architecture segments, the hexagon is often used to create the illusion of a cube by connecting every other vertex to the center, forming three diamonds, and shading each diamond differently, as shown below. With their simultaneously modern and historical background, hexagons are continuing their rise in popularity with the increase of renovation efforts in both public and private spaces, such as homes, retail spaces, hospitality venues, and more. Lastly, depending upon the look and feel you’re trying to exude with hexagonal tiles, your hardest decision may just rely upon the size of the tile. Do you want to create a high energy, dramatic environment with smaller formats, or would you rather create a more laid back, relaxing atmosphere with a larger format of hexagon tiles? It’s all up to you, and that’s the beauty of this classic shape ‒ it becomes what you want it to be! 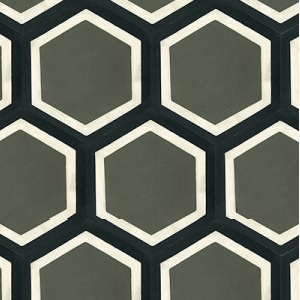 View our comprehensive Hexagon Cement Tile Buying Guide here! For more information and inspiration about patterned and plain hexagon tiles, visit our comprehensive Hexagon Cement Tile Buying Guide. Geometrical shapes and patterns are currently enjoying their time in the design spotlight, most especially hexagons. From fabrics and textiles to furniture, and of course tiles, this rediscovered polygon is meeting the demands of various decorative styles. Using handmade cement tiles for your remodeling/renovation, or new construction project will not only enhance the look of your home, it will also play a well-deserved role in retail and hospitality spaces. Rest assured the cement tile you choose will withstand the test of time. For whichever project you choose to conquer, Avente Tile is here to help you reach your design goal. Our extensive Cement Tile Design Ideas gallery features a large collection of projects dedicated to adding excitement in any space. How can we help inspire you today?